What is Latin Quarter and where can you find it? This guide will help you find out all the important information about the heart of Paris. What is the Latin Quarter in Paris? The Latin Quarter is an area located in the heart of Paris on the left side of the river Seine. The Quarter is surrounding the area of the University of Sorbonne. That is also, in a way, where the name comes from. During the Middle Ages, the University of Paris – now wildly referred to as Sorbonne – was in its golden years and the whole area was filled with students who spoke Latin. Therefore, the Latin Quarter. Nowadays, the Latin Quarter is the part of Paris that managed to preserve its old charm and authentic Parisian atmosphere. You will see that this vibrant place with its many cafés and restaurants is the heart of tourism. Having all the touristic attractions in a walking distance or easily accessible by metro makes it a great place for all the visitors to stay. Place Saint-Michel is one of the famous squares of Paris. This square is located on the border of the 5th and 6th district on the border of the Latin Quarter. The square was enlarged in the past, during the Restructuring of Paris in the 19th century. On the north side, the square transforms into the Pond Saint-Michel (the Saint-Michel Bridge) that connects the left bank of Seine to the Île de la Cité. The Bridge Saint-Michel is over 60 meters long. Originally from the 14th century, the bridge was severally rebuilt, most recently than in the late 19th century. 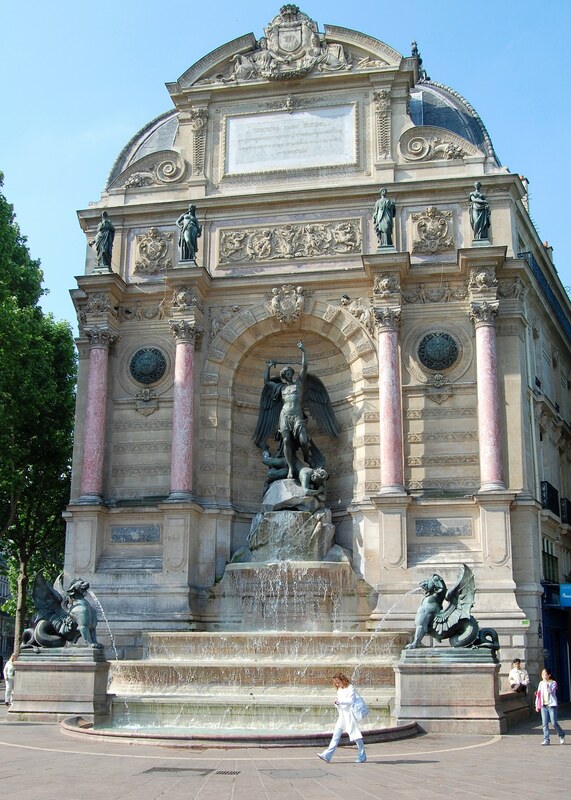 The beautiful domain of the Place Saint-Michel, you should see, is the Fontaine Saint-Michel. The fountain was constructed during the Restructuring of Paris and designed by the architect Gabriel Davioud. The main part of the monument is the several statues. The most important being the Archangel Michael (Saint Michel) and the devil, the two dragons on the sides and the four statues representing the cardinal virtues (Prudence, Power, Justice, and Temperance). You will find out that Sorbonne can mean more than just one thing. Sorbonne refers to the main buildings on the street Saint-Michel as well as the theological college from the 13th century. 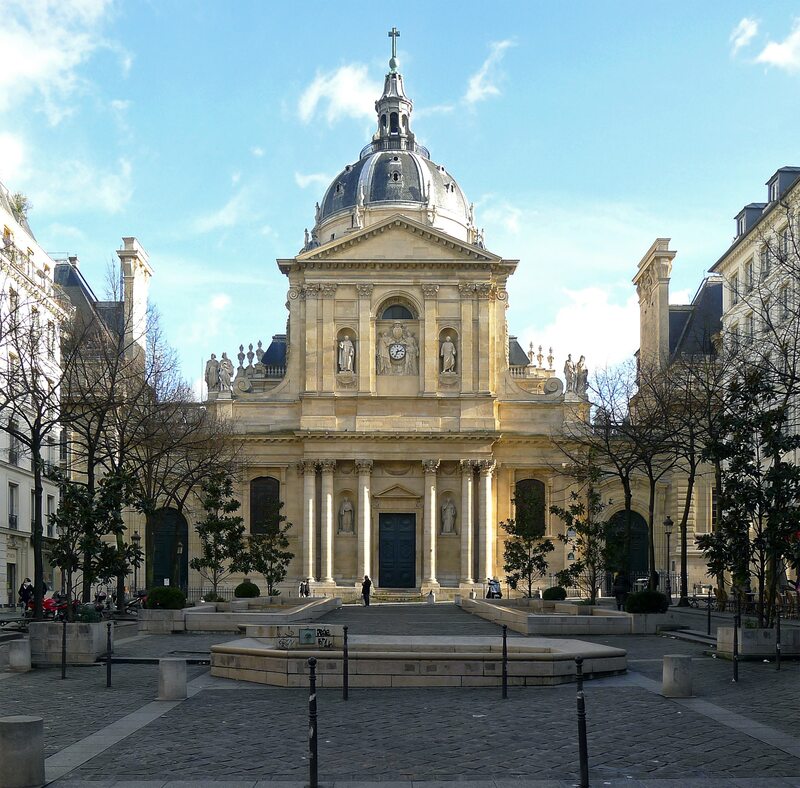 The history of the college is very interesting not only because the Collège de Sorbonne was one of the first colleges of the medieval University of Paris, but also because of its evolution throughout the centuries. After the building of Sorbonne was build, the college started to use it as its facilities. The college played a huge role in the events of May 1968. The buildings’ look is from the break of the 19th and 20th century and was designed by Henri-Paul Nénot. The complex combines several architectonical styles but still looks and feels harmonious and well put together. You will also see the crown jewel of The Chapel of Sainte Ursule. The Chapel of Sainte Ursule de la Sorbonne on of the buildings in the Sorbonne complex and was built in the 17th century. Luxembourg Gardens are located in the 6th district and lie on the border of the Latin Quarter and Saint-Germain-des-Prés. Created by the beginning of the 17th century upon the initiative of Marie de’ Medici, the gardens are a nice addition to the Luxembourg Palace, that is now the meeting spot for the French Senate. The gardens are known to be a very calm place. You can take a walk and admire the sculptures and monuments that are featured all over the place. The Medici Fountain is another thing worth seeing if You decide to visit the Jardin du Luxembourg. In a form of a grotto, the fountain is a popular feature of an Italian Renaissance garden. What is interesting is that the Medici Fountain hides another fountain just behind itself. Fontaine de Léda, also known as “the Hidden Fountain”, was constructed almost 200 years later. It was commissioned by Napoleon Bonaparte and originally it was located at the corner of the rue de Vaugirard. Don’t forget to check it out on your way through the gardens! On the north end of the gardens, you can see already mentioned Luxembourg Palace. The Palace was also built upon the initiative of the regent Marie de’ Medici. It was designed by Salomon de Brosse and after Revolution (break of the 19th century), refashioned and enlarged by other architects. It is a beautiful palace inside and out. The entry to the gardens is free, however, there are specific opening hours you need to be aware of. According to the season, you can visit the gardens between 7:30 am and 8:15 am. They close seasonally between 4:30 pm and 9:30 pm. You also have an option for a guided tour. One of the early examples of neo-classicism in Paris is the Panthéon. You can find it in the heart of the Latin Quarter on the top of the Montagne Sainte-Geneviève. Originally, the Panthéon was built as a church dedicated to Sainte-Geneviève. However later, it became a mausoleum for distinguished French citizens. It is a great honor to be buried here and it is allowed only by the act of “National Heroes”. Some of the people buried in the Panthéon include Voltaire, Victor Hugo, Marie Curie, Émile Zola or Jean Moulin. With the height of over 80 meters, this majestic building should be definitely on Your To-GO list! If you decide to go inside, the entry would be 7€ – 9€ for a regular ticket. The admission is, however, free for people under 26 year of age (from EU). It also includes disabled people, job seekers and people who receive French state benefits. If you visit the Panthéon on the 1st Sunday in a month the entry is free for everyone. However, this only applies from 1st November until 31st March. The opening time vary based on the season. From 1st April until 30th September, the opening hours are from 10 am to 16:30 pm. From 1st October until 30th March, the opening hours are from 10 am to 6 pm. There is also an option for group guided tours in French. However, if you decide to join one you need to arrange it one and a half months in an advance. National Museum of Medieval Art is located in the medieval palace that was built in the place of Roman baths. You can find it in the 5th district, south of Boulevard Saint-Germain. The main attraction of the Museum, you can check out, is the 6 tapestries “The Lady and The Unicorn”. However, the Museum and the whole complex of buildings have so much more to offer! Originally built for the abbots of Cluny in the 14th century, this structure combines elements of Gothic and Renaissance styles. You will find that this complex of buildings is an amazing example of medieval civic architecture. The Museum itself is consisting out of 2 part, both build on the remains of the Gallo-Roman baths. Some of the collections residing in the Museum include already mentioned tapestries, Devil and the Woman stained glass piece, several marble sculptures, Health collection of Ibn Butlan and much more. You will buy the ticket for only 5€! Note, that the museum is often visited by school groups on Mondays, Thursdays, and Saturdays. The best time to visit is either between the noon and 2 pm or after 3 pm. Here you can download the map of the museum. One of the oldest neighborhoods lies in the 5th district on the edge of the Latin Quarter. 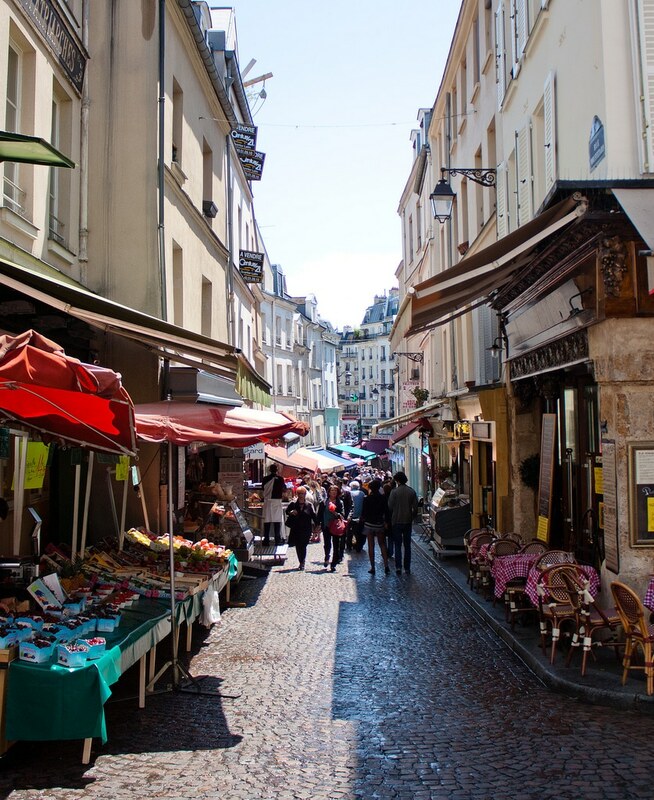 With its street markets, it is also one of the liveliest places in Paris. The streets history runs far back to the Stone Age when the Romans built the road from the Rive Gauche (settlement on the left side of Seine) to Italy. This mostly pedestrian avenue, with all its restaurants, cafés, and shops, is location enjoyed by many tourists. So don’t hesitate and join them! One of the few regular open-air markets take place here and so many locals also visit this area to buy fresh foods. If you want to experience authentic Paris, this market will help you with that. One of the most important remains after the Roman empire is the Arenas of Lutetia. The name “Lutèce” was the name of predecessor Roman city that was in place of present Paris. This amphitheater is located in the heart of the 5th district and has lasted for almost 2 thousand years. The Arena was constructed for almost 15,000 people and was meant for a showing of the gladiatorial battles. However, with the structure including a podium, the whole place resembles rather the structure of an ancient Greek structure rather than a Roman one. Either way, it is definitely worth a visit. The admission is free and opening hours depend on the season. Either way, you will find that the shortest time span is from 9 am until 6 pm. You should have no problem to check Arenas out during this time. The Church of Saint Sevérin is proudly one of the oldest churches on the left side of the Seine. You will find it in the north part of the Latin Quarter, close to the Saint-Michel square. The current construction is from the 16th century. However, previous forms of the church date back to the 11th century. If you are a fan of medicine, wait for the next fact! This Roman Catholic church was the place where the first recorded gallstone surgery took place. Isn’t that interesting? If you decide to visit this church, the opening hours are regular. From 11 am to 7:30 pm from Monday till Saturday and from 9 am till 8:30 pm on Sunday. You won’t have to pay any fees.